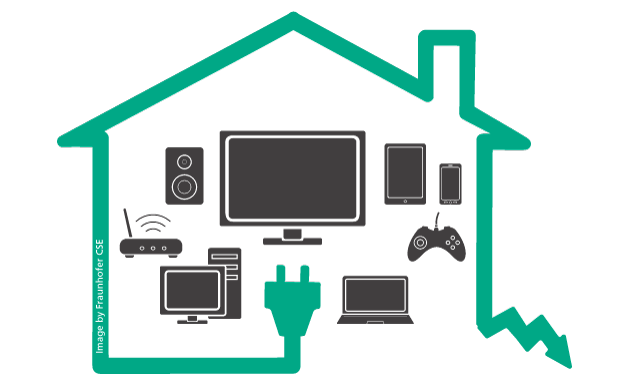 The Fraunhofer Center for Sustainable Energy Systems has completed a study, “Energy Consumption of Consumer Electronics in U.S. Homes in 2017,” the fourth in a series commissioned by the Consumer Technology Association, to provide up-to-date information to support energy policymaking in a rapidly changing industry. Consumer electronics – devices like televisions, set-top boxes, and computers – consumed about 143 billion kWh in 2017. Powering these devices now costs consumers $18 billion annually, or $155 per household. While many devices added new features and higher performance, the total energy use of consumer electronics has fallen by about 25% since 2010 and 14% since 2013. Driving this downward trend, the number of installed devices – those plugged in at least once during the past month – fell by 10% since 2013 to 3.4 billion, about 29 per household. The number of televisions, which now account for 24% of all CE energy consumption, continued to fall, while older CRTs have been mostly retired or replaced by newer, more-efficient LCDs. A shift toward portable devices, like laptops, tablets, and smartphones, contributes to the overall decline. About one quarter of all electronic devices are portable, yet collectively they use less than 5% of the total energy. Changing system architectures are leading to new energy use patterns. Thin-client set-top boxes, for instance, are becoming more common in multi-TV homes. Integrated access devices that provide Wi-Fi and broadband modem functions in one device are becoming far more common. Using a bottom-up approach, the study estimates the installed base, typical annual usage, and power draw by mode of nearly 50 device categories, studying a subset in greater depth (TV, set-top box, soundbar, video game console, computer, monitor, network equipment). Phone surveys identified ownership and usage behaviors of televisions, soundbars, computers, and video game consoles. For the first time in the series, Fraunhofer CSE performed an uncertainty analysis for selected categories to identify knowledge gaps to address in future work. Download Report: Urban, B., K. Roth, M. Singh, and D. Howes,. (2017). Energy Consumption of Consumer Electronics in U.S. Homes in 2017. Fraunhofer Center for Sustainable Energy Systems Report to the Consumer Technology Association. Dec.